AngularJS Routing can be used to create various URLs for different content in an application. Explaining in detail, when building an application with different features and different areas, all the functionality cannot be put into a single controller in a single view. So, it requires multiple views, and multiple controllers. Each view and controller is responsible for a specific feature or area of functionality, and now all the functionalities are spread around. When users are viewing such kind of application, it may not be possible to guess what they are looking for and their current location. When these links are loaded by the browser, similar AngularJS application is loaded and saved at http://domain.com/home.html. But, AngularJS searches the route (URL part after #) and decides which HTML template to display without reloading the entire page. This will give access to a new module, a module that the application module will need to take a dependency on; this new module is called ng-route. Using a component in ng-route, routing rules can be configured into the routing engine where the URLs are described for an application. Routing engine has to be given information on how it should respond to a particular URL that appears in the browser. With ng-route, this is done using a component known as $routeProvider. The ng-route module’s config() configures the $routeProvider. $routeProvider is considered as a parameter by config() function and the routing configuration goes inside the function. It has an API where description is given for what the URL looks like and what to do for that URL. For each URL, a templateUrl is specified and that is the HTML that Angular has to go, find and load up for that route. And, then optionally a controller should be used to manage that template. Below is the code for AngularJS Route Example. 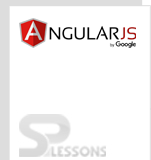 In the above example, First, AngularJS routes library file is created. Then, a user declares a dependency to the AngularJS Route Module in js file. Under config of spApp module, $routeProvider is characterized as a function, utilizing key as ‘$routeProvider‘. $routeProvider.when defines a url “/route-1“, which then is mapped to “template-1.html“. template-1.html has to be there in the similar path as of html main page. If html page is not defined, then default view will be set. Controller is utilized to set the corresponding controller for the view. Using a component in ng-route, AngularJS routing rules can be configured into the routing engine where the URLs are described for an application.